Nelson Ireson October 28, 2016 Comment Now! 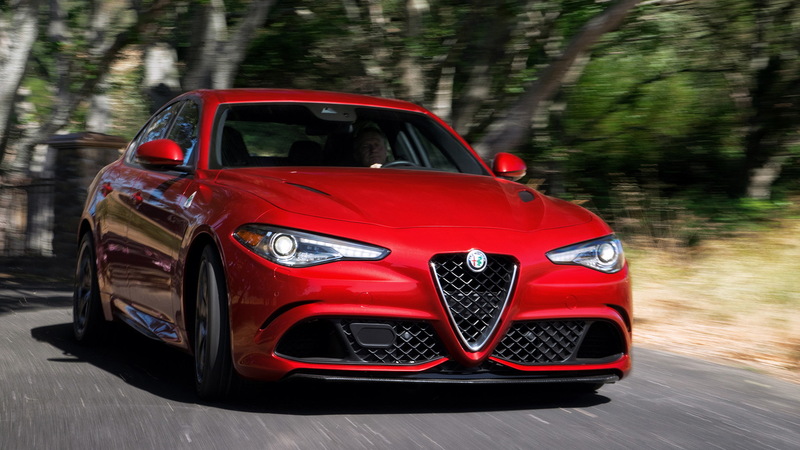 Cracking off shifts of the ZF 8-speed automatic with the column-mounted aluminum paddle shifters, the 505-horsepower turbocharged 2.9-liter V-6 snarling like a staked pitbull, and railing up the fast, heavy g-loading of Turn 1 at Sonoma, the 2017 Alfa Romeo Giulia Quadrifoglio tucks in and rotates with an alacrity that borders on alarming—especially if you've engaged the rather permissive slip angles of Race mode via the console-mounted DNA drive selector. It's a revelation for a luxury sports sedan, and a welcome one. The Giulia Quadrifoglio is a driver's car in a way that the BMW M3 and even the mighty Mercedes-AMG C63 S simply can't match—even though Alfa has made some decidedly odd choices along the way. First among the odd choices for the Giulia is the complete absence of a manual transmission from the American market. That's right—even though it's offered in Europe, the product planners for the U.S. just don't think it makes sense to offer the manual, even on the Quadrifoglio, because no one would buy it. When asked, Alfa's reps claim a mere 1.0 percent of buyers would even be interested—never mind the fact that sales figures for many other enthusiast-targeted cars in America include plenty of manual gearboxes. But whatever the ultimate figure would be for Alfa's latest offering, an outright refusal to even offer the manual option is a bizarre choice for a car that's all about passion and ensuring the "driver drives the car," rather than the "car driving the driver," a criticism Alfa lobs at its competition often and pointedly. The next odd choice for a car that's ostensibly all about the experience is the brake-by-wire system. Rather than the driver pressing a pedal that directly actuates the hydraulics that clamp brake pads to rotors, the Giulia (both standard variants and the hot Quadrifoglio) has a rubber block to simulate pedal feel and an electronic sensor that detects pedal movement, then translates this to a computer signal that activates the brakes for you, applying pressure to the carbon ceramic discs according to some algorithm. The Quadrifoglio does get a stiffer rubber "feel simulator" and shorter pedal travel than the standard Giulia, giving it somewhat more appropriate feel on track or in spirited driving, but there's still a notable disconnect between the car's braking behavior and any sort of feel through the pedal. That lack of feel continues to the steering, which despite a brilliantly quick 11.8:1 ratio, is almost entirely devoid of anything resembling information about what the tire's contact patch is actually doing at the road surface. Because of the very quick steering ratio, and the car's staggered 245/35 19-inch front tires and 285/30 19-inch rears, it's easy for the driver to induce understeer with too-quick movement of the hands at turn in, with trailing brake at corner entry, or with too-early power at corner exit. 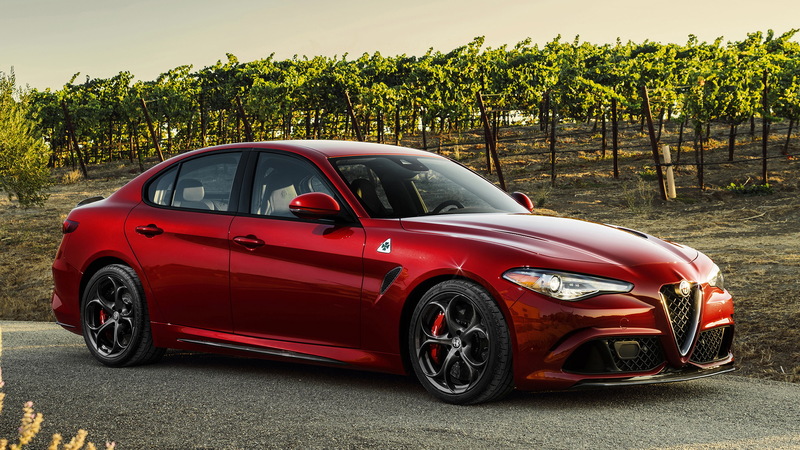 Driven hard, with only the minimal driver aids of Race mode engaged, the Giulia Quadrifoglio is a willing companion that's held back only by its relative lack of front grip. But will it oversteer? Oh my, yes. In fact, the Giulia Quadrifoglio is one of the most controllable, enjoyable new cars on the road when it comes to getting and staying sideways, whether on dry, sticky pavement or rain-slicked roads. The 505-horsepower and 443 pound-feet of torque are delivered in a decidedly non-linear way, ramping slowly to 4,000 rpm or so, then rapidly shooting for the stars and its 191 mph top speed. The close-spaced gears (through fifth gear, at any rate) enhance the tractability of the engine, seeking to keep you in the sweet spot for maximum thrust. The sudden surge of power gives the relatively small turbo V-6 a great deal of character, and also makes breaking the rear loose a trivial endeavor. But in Race mode, though the dash will warn you ESC is off, there's a sort of two-stage safety net. It will let you play, up to a point, before it halts the progress of your slide and does its best to keep you at that angle—without shutting you down and pulling you straight. No fun police here—just some welcome and capable escorts. Back off the hoon's antics, and drive the Giulia Quadrifoglio properly, however, and everything comes together in concert. You don't notice the lack of steering feel, just the car's nearly instantaneous and telepathic turn-in; you don't notice the lack of brake feel, just the slight sense of urgency when the car's speed and weight overcome the grip available at the front tires; and you don't notice the lack of a manual transmission, or even a proper dual-clutch automatic as the paddles deliver precise, sub-100-millisecond shifts with no unasked-for upshifts or downshifts, ever. 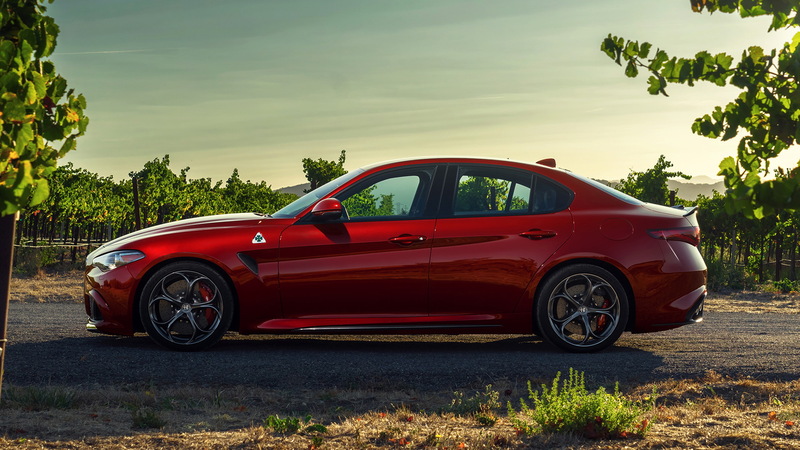 All you notice when piloting the Quadrifoglio toward the limits of adhesion is the remarkably neutral balance, the rapid surge of power, and the ache in your cheeks as you smile continuously from green flag to checker. If anything the claimed 3.8-second 0-60 mph time feels conservative. 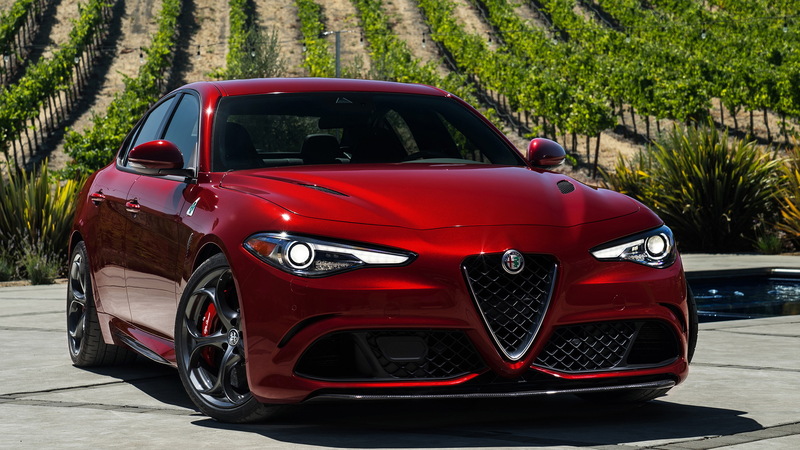 For those who might want something a bit different from the German, Japanese, and American offerings in the segment, but don't need or crave the 505-hp Quadrifoglio, the same core competence of the chassis can be found in the regular Giulia models, and in what will probably become the sweet-spot model of the line, the Giulia Ti with the Sport package. Nimble handling, quick steering, and a punchy 280-horsepower, 306-pound-foot turbocharged 2.0-liter four-cylinder make quick work of any back road, as well as the speed limit, hitting 60 mph in just 5.1 seconds and a top speed of 149 mph. 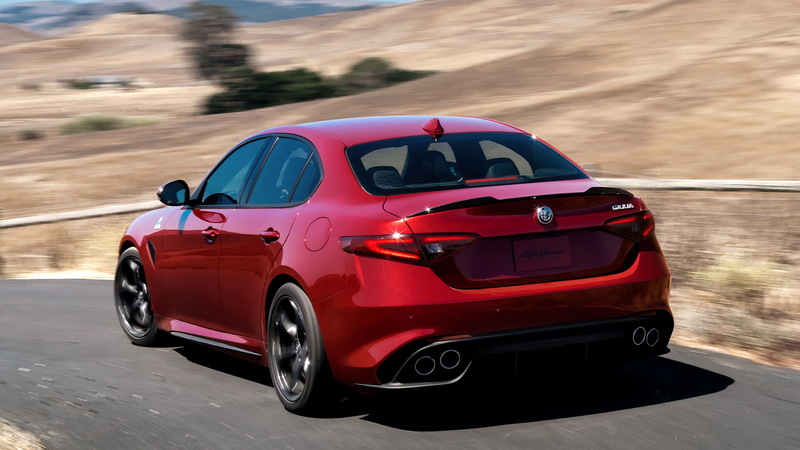 After just a few short hours of road time and a baker's dozen of laps around the track, it's hard to say how the Giulia will hold up in the daily grind (both the Quadrifoglio and the four-cylinder models are perhaps too stiff for some in daily use)—but when it comes to outright fun, driver engagement, and the sheer joy of driving, the Giulia Quadrifoglio stands at the very top of the segment—right alongside its record-setting 7:32 Nürburgring-Nordschleife lap time. Maybe those odd choices weren't so odd after all. The 2017 Alfa Romeo Giulia range is due in showrooms by the end of 2016. Pricing is yet to be confirmed but Alfa Romeo has stated that the Quadrifoglio will start around $70,000.